There's one thing we all know Victoria's Secrets models definitely wear well (do I have to spell out lingerie here? ), but a handful of the models secured for the world-famous runway shows also have impeccable off-duty style. Whilst only a few are bestowed "Angel" status by the brand (a sure-fire way to get into the highest-earning echelons of supermodeldom), we're more interested in handing out accolades that relate to what they look like when wearing (their own) clothes. Elsa Hosk is a VS girl we come back to time and again thanks to her New York City wardrobe, Leomie Anderson provides us with countless new ways to wear our favourite sneaks, and we all know just how much Bella and Gigi Hadid can spark a trend in a flash. 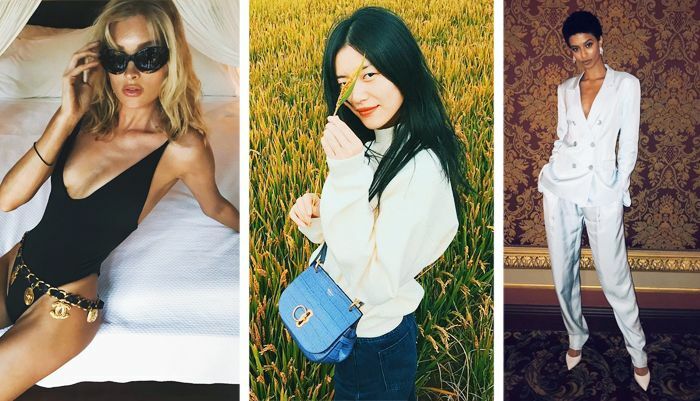 Lily Aldridge has a dress collection TDF, Stella Maxwell knows the power of a plain white tee and jeans while Alanna Arrington is our go-to girl for streetwear. Each of their personalities is allowed to shine through via their Instagram accounts, so we've filtered through the 39 names on the runway roster to bring you an edited list of the most stylish and inspiring models to follow now. Style Notes: Swedish model Elsa is the girl I go to when in need of fashion inspiration. She's quite experimental (see this Chanel belt-and-swimsuit combination), whether she's partially clad or fully wrapped up in a duvet coat to brace the NYC chill. Expect to find cool new brands aplenty on her feed. Style Notes: Oh so chic. Jourdana Phillips is the American beauty with the most grown-up and sophisticated wardrobe of all the VS crew. Her slinky eveningwear options feel rather Parisian despite Houston being her hometown. Check her out for demure midi dresses, sassy suiting and the occasional body-con number. Style Notes: Brazilian-born Gizele obviously looks cracking in all of her bikini shots (it's a natural talent if you come from this part of the world, right? ), but it's her offbeat off-duty model ensembles we love the most. She's a big fan of the beret, jeans, vintage tees and indie labels such as Reformation, AreYouAmI and For Love & Lemons. Style Notes: If sportswear and streetwear are your jam, Alanna is the Victoria's Secret girl for you to bookmark. She's adept making hoodies, track pants, skate sneaks and hoodies look upmarket, and well, then there's her incredible curly hair. Style Notes: Blonde bombshell Dev Windsor has the kind of hippy American-girl style any lover of Free People will really be on board with. She does bohemian the subtle way, with billowing fabrics, retro prints and muted tones. Style Notes: The Tanzania-born, Canada-raised Herieth is a total style chameleon, switching from this kind of sports-luxe look above through ultra-girlish pink feather-trimmed dresses for an awards do. Whatever the dress code, she's not afraid to be adventurous, and we salute the fact that she smiles in every single picture—our kind of girl. Style Notes: Chinese beauty Liu was the first model of East Asian descent to walk the Victoria's Secret Fashion Show and is one of her country's most well-known and adored faces. As for her personal style, she'll be an inspiration to anyone who appreciates minimalistic formulas of soft knits and simple pairs of jeans. Style Notes: Bruna joins the Brazilian contingent of the VS gang and lives up to the idea, often being photographed on the beach or from a tropical location where flouncy blouses, killer swimsuits and denim shorts are the daily uniform. She's a fan of cute prints, leg-baring dresses and white swimwear—aka your next holiday wardrobe. Style Notes: Belgian model Stella really fills the role of the archetypal off-duty girl when it comes to her fashion choices: Think white tees worn with skinny denim and ankle boots or sneakers. Throw on a leather jacket and you have yourself a very trustworthy combination. Style Notes: Do we really have to intro the leggy goddess who is Karlie Kloss? She's the kind of girl who has access to incredible clothes but always manages to put a casual spin on them to make us all feel like perhaps—just perhaps—we could be a bit more Karlie tomorrow. She often leans on classic jackets (denim, bomber, trench) to wear with flat shoes and a cute dress. Style Notes: Chinese model Sui He doesn't appear to have one set style, but what we can rely on her for is pretty, subtle, easy-to-copy outfit creations (think jeans and an off-the-shoulder blouse) that will always see you through the weekend from chi-chi brunches through to sightseeing and a party. Style Notes: Dutch fashion model and Victoria's Secret veteran (well, she started in 2015 and some of the girls here have only just walked their first runway for the brand) is a source of sunglasses, crop tops, great coats, Gucci bags (Gucci everything, actually) and the occasional bit of Ganni. Style Notes: If Isabel Marant's breed of boho is your kind of boho, then you need to check out Martha Hunt's profile. She's all flippy dresses, bare legs with boots, homespun cardigans and rock-chick ankle boots. Style Notes: Leomie Anderson represents the Brits in the VS lineup and does so with her signature mix of streetwear and designer gems, directional styling moves and a keen eye for a high-street bargain—like this amazing ASOS knitted dress she's wearing here. Style Notes: Lily Aldridge has a legendary band tee collection, but she's also no stranger to super-pretty dresses. Whether on holiday, hitting the red carpet or being spotted off-duty in NYC, this woman sure knows how to pick a flattering, classic frock (or 17).